YEREVAN (ARKA)—The Renewable Energy and Energy Efficiency Fund, a non-governmental organization whose mission is to facilitate investments in energy efficiency and renewable energy in Armenia, has announced today the launch of a $58 million investment project designed to help advance Armenia’s renewable energy sector. The project is being implemented by the Renewable Energy and Energy Efficiency Fund with the support of the Climate Investment Funds, the Armenian Ministry of Energy and Natural Resources, the World Bank, and the Asian Development Bank. The project will last for 5-6 years, Tamara Babayan, director of the Renewable Energy and Energy Efficiency Fund said at a news conference. “The main components of the project will start in 2017. By 2020 we expect to have solar power stations with the total capacity of 40-50 MW,” Babayan said. One of the project’s components is geothermal exploratory drilling in the southern Armenian region of Syunik to determine geothermal energy potential. Before winter arrives, a road will be built to the drilling site, she said. According to Babayan, alternative energy, in view of imminent rise in electricity prices and revolutionary changes in solar energy production technology, is more profitable and for investors. 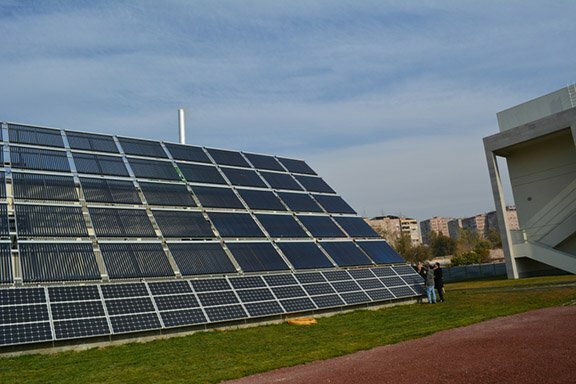 Renewable energy sources accounted for 13% of total energy produced in Armenia in 2013. The Climate Investment Funds (CIF) provides 63 developing and middle income countries with urgently needed resources to mitigate and manage the challenges of climate change and reduce their greenhouse gas emissions. Since 2008, the CIF has been championing innovative country-led investments in clean technology, renewable energy, sustainable management of forests, and climate-resilient development. Fourteen contributor countries have pledged a total of $8.1 billion to the CIF, which is expected to leverage an additional $57 billion from other sources. The largest donors are the United States, the United Kingdom, Japan, and Australia. Good! This is one of the good ways to go. More power to you. Bravo!